'Avengers: Infinity War' Sprawls — And (Mostly) Delivers The Avengers try to keep a space-tyrant from bedazzling his space-glove and performing cosmic genocide. The film doubles down on character interactions both familiar (good) and unfamiliar (less good). 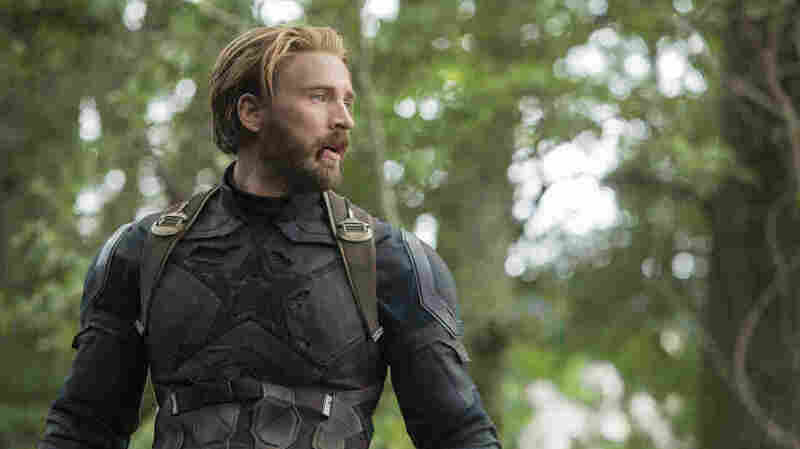 Hirsute hero Captain America (Chris Evans) is takin' care of bushiness in Avengers: Infinity War. Avengers: Infinity War is — and truly feels like — the culmination of something. Over the course of many years and many more Marvel Universe films — including some that proved to be hugely successful (Guardians of the Galaxy) and some that proved to be Thor: The Dark World -- the proprietors of that universe have been nesting glowy magical gemstones inside their heroes' stories. We nerdlings familiar with the 1991 Marvel Comics mini-series Infinity Gauntlet (written by Jim Starlin with art by George Perez and Ron Lim) have been waiting patiently for a certain big bald Marvel villain to come along and collect/hoard those sparklies like some kind of purple, cosmically powered space-tyrant/magpie. Thanos is here at last — an alchemical blend made up of state-of-the-art CGI, an oddly wistful performance from actor Josh Brolin, and Violet Beauregarde's post-gum skin tone — and he's fixin' to cause Trouble. With a capital T, and that rhymes with C, and that stands for cosmic genocide. Who can stop him, or at least try to? Pretty much every actor who's ever cashed a Marvel Cinematic Universe paycheck, is who. Which is why, even with its two-hour-and-40-minute running time (belay that "Infinity Kidney Stones" joke, it's been made), Infinity War still manages to feel overstuffed, crammed to the gills with characters and locations and events and stakes. That's the setup. But in the interest of efficiency in criticism, we must acknowledge that the potential audience for Infinity War is large, and consists of people who come at it with widely varying degrees of Marvel Cinematic Universe engagement. And knowledge. And — let's be blunt — level of interest. Thus we are attempting to account for this fact by providing discrete reviews, expressly tailored to your individual needs. Picture yourself in the theater with a friend. No really, picture it: You're about to see Avengers: Infinity War. The trailers are over. The lights dim. The Marvel Studios logo appears on the screen. At that moment, you lean over to your friend, and you whisper something. Choose from the options below, and then scroll down to find your Personalized, Artisanally Blended Avengers: Infinity War Movie Review. "So. The Avengers. They're the ones with Batman, right?" "Is [My Favorite Marvel Character] in this?" "They had better not kill off [My Favorite Marvel Character]." "I saw the trailer, and I can't wait for the scene where [something]." "How in the world are they gonna take all these characters and tell a story that makes any sense?" "OK, so: Remind me where all the Infinity Stones are, as far as we know?" "I hope it feels like an old-school summer comics crossover." "I just hope it's fun." "I hate these stupid superhero movies. They're all pointless, loud, violent fodder served up for the dull-witted masses. I am here against my will. It's possible I'm on a bad date but it's more likely I have been kidnapped. Please contact the authorities. Blink twice if you understand me." No. No, the Avengers are not, as you say, "the ones with Batman." Clearly, you belong to that subset of Infinity War audience members that doesn't care overmuch about the mythological infrastructure of the Marvel Cinematic Universe. And that's fine — ideally, you shouldn't need to bring a scorecard, physical or mental, along with you. The film should stand alone as a full experience, regardless of your particular level of nerdery. But to you I say: Proceed with caution. First, ask yourself: If some character I don't recognize steps out of the shadows and the audience around me gasps in shocked recognition (this happens at least twice) — am I OK with that? When the camera cuts to some random location, the music swells and a legend appears at the bottom of the screen that is supposed to be the name of said place but is obviously just some dumb, made-up nerd-word that doesn't mean anything — will I be miffed? If the answer to either of those questions is "Yeah, probably," maybe wait for it to hit the streaming services. Don't worry too much about getting lost in the mechanics of the plot, however — it's a simple series of fetch quests. Thanos wants to collect the various Infinity Stones. You'll know what those are when you see them, and at one point you'll be treated to a kind of mystical slide deck about them, plus you'll be told "If he collects all six, he can kill half the universe" enough times that you'll understand the opposing sides. Yes, probably. That's ... kind of the whole point of the exercise. Provided you realize that the X-Men and Deadpool aren't really invited to the intellectual-property party, you can be reasonably certain your own favorite character appears onscreen at some point. ... With two notable exceptions. Notable chiefly because their absences are explained in a throwaway line that gets thrown away by the character tasked to deliver it like it's a soiled diaper. But in most other cases, your favorite character will get some business to do. It may not be a lot, but they will hit the familiar beats you want them to hit. In previous Marvel films, character deaths served their usual superhero-genre purpose: They motivated the heroes into action. Yyyyyeah, careful there. The official Infinity War trailers include several shots that aren't in the film. That happens all the time, of course — they probably come from scenes that got deleted for time. But there's at least one trailer image that looks like it was an intentional fake-out. That is an excellent question, and Infinity War answers it smartly, if not always effectively. The filmmakers know that over the life of the Marvel Cinematic Universe, their different characters vibrate at different frequencies, so the films built around them have adopted different tones. This is perhaps the biggest reason for their success — Captain America and Iron Man, for example, are wildly different characters, and their films feel that way. When they come together in an Avengers film, they clash — and as they're brought into conflict, the filmmakers and actors seize the opportunity to delineate them further, bringing their respective characterizations into even sharper relief. As a result, the Marvel Cinematic Universe is painted in a variety of tonal colors, not simply a monolithic grayscale. Infinity War doubles down on this character interaction by carefully pairing off its huge cast of characters. When two familiar characters with a well-established dynamic share the screen (Tom Holland's Peter Parker and Robert Downey Jr.'s Tony Stark, most winningly) the film hums along. We get treated to several new duos whose chemistry we perhaps didn't see coming but really should have (Downey and Benedict Cumberbatch's Doctor Strange get their respective goatees in a twist, while Chris Hemsworth's Thor and Chris Pratt's Peter Quill — size each other up in exactly the way you'd expect two such pretty-boy doofuses to do). The technique doesn't always work — and in one instance, fails completely. It's mystifying that a movie that represents the great synthesis of so many long-established storylines should attempt to locate its emotional center in the (to put it charitably) fraught relationship between Thanos, whom we've only just met after all, and Gamora (Zoe Saldana), a character whose interiority fails to register, and who has yet to define herself beyond "resident badass." Thanos is given several bemused monologues that attempt to cast him as something in addition to what he is — a great big honkin' purple (more than a little silly) CGI villain — and Gamora's reactions to him, scene to scene, keep surprising us because they come off as not so much nuanced and complicated as disconnected and puzzling. The film asks this Thanos/Gamora dynamic to carry a lot of weight — too much, in the end — and scenes between them never manage to land with the impact the filmmakers want them to. OK, asking this question of your friend in the next seat suggests that you're in precisely the right headspace for this film. You're curious, you're engaged, you know what the MacGuffins-du-jour are, and why they're important. And if your friend can't answer your question: We can. Rest assured, you won't have to watch six repetitive scenes of Thanos going around and painstakingly collecting all six Infinity Stones — by the time we meet him, he's already got one under his belt. Which is to say: bedazzling his glove. Plus he's got a brace of creepy minions to do some of the his rock-collecting for him. He's a villain who outsources. By that do you mean sprawling, and great to look at, with confusing subplots that send some heroes off to chase still yet another object, far away from the main action? And that some characters don't get enough to do while others get too much? Then yes. Yes, it feels like that. Do you also mean that you keep stopping to wonder why an all-powerful being with burgeoning control over the fundamental forces of the universe itself, who can unmake reality at will, would instead devote so much time and energy to simply ... punching others a lot? Aha, see, now you belong to that vast sea of potential seers-of-this-movie that just wants to bask in high adventure with space-hopping and plenty of jokes (there are more than you might think, and most land) and heroes striking poses and villains sneering and saying things like, I kid you not, "Insect!" You, then, will enjoy this film, most likely. There is, as mentioned above ... just really a whole lot of death, and an ending that is more Empire than Jedi. And if Marvel is committed to having the consequences of Infinity War truly reverberate through this summer's Ant-Man and the Wasp and next spring's Captain Marvel, then consider the stakes raised. Or, equally possibly, razed. I am sorry for the position you find yourself in but I'm confident it will soon resolve itself and that, in no time, you'll be back to your usual routine, commenting on the NPR Facebook page without reading the articles.